TransIT-X2® Dynamic Delivery System은 non-liposomal polymeric system을 이용하여 primary cell을 포함한 다양한 cell type에 효과적으로 형질전환이 가능하다. TransIT-X2® Dynamic Delivery System는 DNA, siRNA의 형질전환에 이용할 수 있으며, DNA와 RNA 한꺼번에 형질전환도 가능하다. TransIT-X2® 는 세포독성이 낮아 형질전환 후에 배지 교체가 불필요하며, serum이 포함된 배지에서 형질전환이 가능하다. 그림1. High GFP Transfection Efficiency in Multiple Cell Lines and Primary Cells Using TransIT-X2® Dynamic Delivery System. 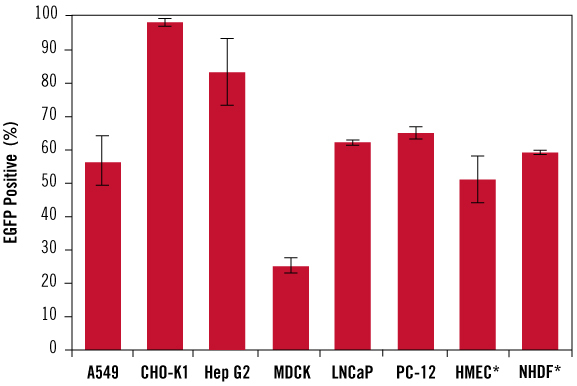 TransIT-X2® Dynamic Delivery System was used to transfect plasmid DNA encoding EGFP into A549, CHO-K1, Hep G2, MDCK, LNCaP, PC-12, primary human mammary epithelial cells (HMEC) and normal human dermal fibroblasts (NHDF). 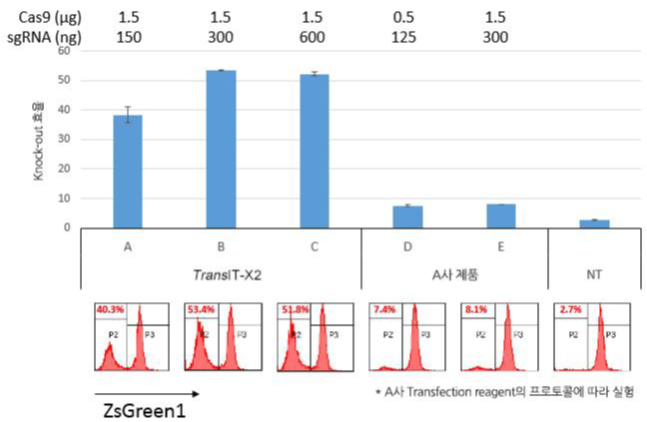 Transfections were performed in 96-well plates using 0.2-0.4 ㎕ of TransIT-X2® to deliver 0.1 ㎍ of DNA (2:1, 3:1 or 4:1 reagent: DNA ratio). Triplicate wells were assayed 48 hours post-transfection using guava easyCyte™ 5HT Flow Cytometer. 그림 2. 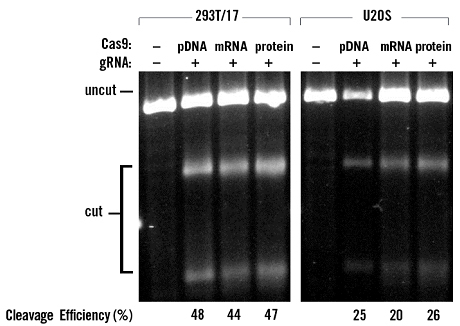 DNA, RNA and Protein Formats for CRISPR Genome Editing. TransIT-X2® Dynamic Delivery System was used to deliver Cas9 pDNA/gRNA and Cas9 protein/gRNA (RNP complex). TransIT®-mRNA Transfection Kit (Code 2225) was used to deliver Cas9 mRNA/gRNA. A T7E1 mismatch assay was used to measure cleavage efficiency at 48 hours post-transfection. TransIT-X2® Dynamic Delivery System (Code MIR 6000) 를 사용한 경우, 타사제품과 비교하여 매우 높은 Knock-out 효율을 확인할 수 있었다 (5배 이상). Mammalian cell 용 고효율 · 저독성 Transfection ..